Growth Stocks are among the most popular stocks for short term traders and investors. Selecting an individual growth stock may be challenging though. Easiest way to buy these stocks is through buying growth stock mutual fund. These growth stock funds are investing in variety of diversified growth stocks. 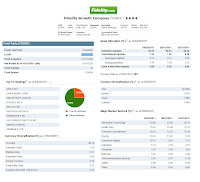 One of the popular growth stock funds is Fidelity Growth Company fund. As actively managed fund, this Fidelity Growth Company fund seeks capital appreciation. This stock fund invests mainly in companies’ common stocks with above-average growth potential. The fund may invest in domestic and foreign companies. The current fund manager is Steven S Wymer. Wymer has been a portfolio manager in Fidelity since 1990 and he started managing this FDGRX fund in January 1997. This fund is categorized as Large Growth domestic stock fund. The fund has a dividend yield of 0.00%. The total net assets of this Fidelity fund are $38.53 billion. The annual holdings turnover of this fund as of November 2011 is 36.00%. The annual expense ratio is 0.89%. The average expense ratio in Large Growth category is 1.31%. This US Stock fund requires investor to invest a minimum initial investment of $2,500 for the brokerage account. Lower amount requires for IRA account ($500). There is no minimum subsequent investment. This is a no-load fund. Meaning there is no front-end sales load fee and no 12b1 fee. There are 71 brokerages that sell this fund like E Trade Financial, Merrill Lynch, Schwab Retail, JP Morgan, Vanguard, T Rowe Price, TD Ameritrade Inc, Pershing Fund Center, Royal Alliance, Raymond James, Firstrade, Scottrade TF, etc. This FDGRX fund has a total of 310 holdings as of September 30, 2011. The top 10 holdings are Apple Inc, Exxon Mobil Corp, Salesforce.com Inc, Google Inc A, Red Hat Inc, Discover Financial Services, Pharmasset Inc, Lululemon Athletica Inc, Amazon.com Inc and Herbalife Ltd. These 10 companies represent 26.34% of the total portfolio. United States remain the top country diversification of this fund with the allocation of 92.69% of the total assets. The major market sectors are Information Technology (33.60%), Health Care (15.91%), Consumer Discretionary (15.43%), Energy (10.32%) and Consumer Staples (10.01%). The principal risks of investing in this growth stock fund is Stock Market Volatility Risk, Foreign Exposure Risk, Issuer-Specific Changes, and Growth Investing style risk.